On Tuesday July 10th, a small group of Jr. A.C.R.Y. members and I embarked on a trip to St. John the Compassionate Mission in Toronto, Canada. The group included Fr. Miles Zdinak, Fr. Peter Paproski, Paul Zdinak, Tim Paproski, Greg Kowal, Anastasia Koss, Alyssa Waryanka, and me. Although not all of us traveled together, both cars had no trouble crossing the border. We arrived at the Mission in the late afternoon where we were greeted by Fr. Deacon Pawel. After receiving a short tour of the Mission, we were shown to our living quarters, which were in a house just a short drive away. Over the next couple of days, I had an absolutely fascinating experience as a member of the Mission’s tight-knit community. This is a place where the meals are served family style at round tables and the locals who are in need sit together in fellowship to enjoy their food. It amazed me that the manner in which the meals were served transformed a “soup kitchen” into a dining hall. During the meals, the members of our group broke off individually and sat alongside those who dropped by for some food. In addition to hearing some moving stories,we learned after just a few conversations that people come here because they recognize it as a place of love, community, and acceptance, not just as a place to be fed. In fact, Fr. Roberto and Fr. Deacon Pawel explained to us that the main goal of the Mission is to give everyone who enters a sense of belonging and worth. They never force Orthodoxy on anyone who goes to them for counseling or offer it as a solution to the problems that plague many members of the community, but thechurch’s doors are always open and a prayer is said before each meal. They expose everyone who enters the doors to our faith simply by living it themselves every day. In order to leave our mark on the Mission, we spent most of our available time painting the kitchen and the exterior walls of the building. Both were in desperate need of a fresh coat of white paint. Every day at 10:00 a.m. and 2:00 p.m. a bell was rung to call everyone present to the dining hall for tea time. During these breaks from our work, we all enjoyed a great deal of laughter as well as several varieties of delicious bread from the Mission’s retail bakery, located next door. 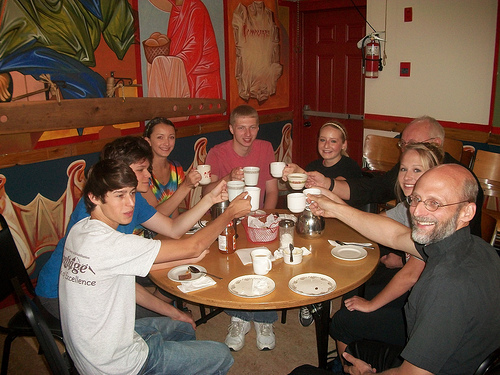 On one evening, a group of the parish’s youth gave us a small tour of Toronto and treated us to some delicious crepes. Although the Mission has a great deal of regular volunteers, they always welcome groups or individuals who want to dedicate some time to their organization. After only a few days there I felt like a part of their family. The experience has improved my own outlook on life and has introduced me to some wonderful people who live Orthodox Christianity to its fullest. I would love to return to the Mission in the future to offer some assistance and to once again experience the community that I instantly fell in love with. By Irene Grysiak - St. John the Baptist Orthodox Church, East Pittsburgh, PA.